Author: Willis Eschenbach / Source: Watts Up With That? 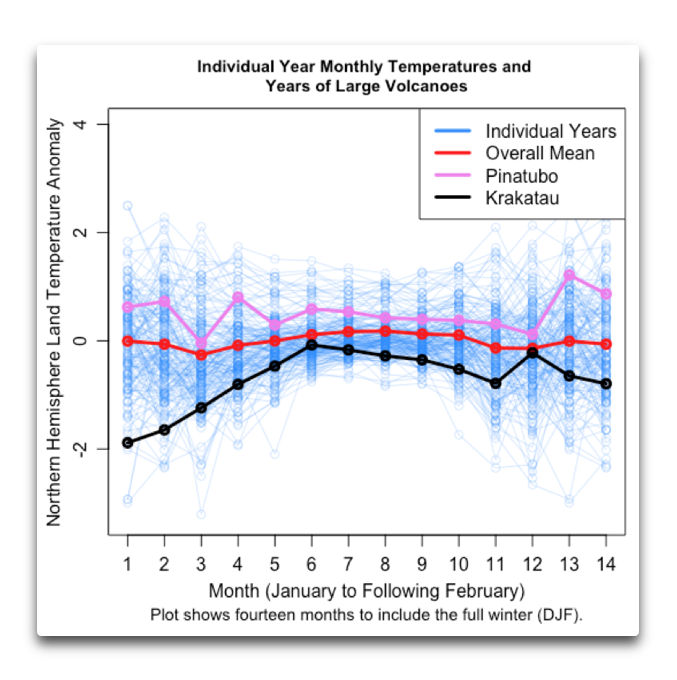 Observations show that all recent large tropical volcanic eruptions (1850-present) were followed by surface winter warming in the first Northern Hemisphere (NH) winter after the eruption. Recent studies show that climate models produce a surface winter warming response in the first winter after the largest eruptions, but require a large ensemble of simulations to see significant changes. It is also generally required that the eruption be very large, and only two such eruptions occurred in the historical period: Krakatau in 1883 and Pinatubo in 1991. So, when they say “all recent large tropical volcanic eruptions”, they actually mean “only two of all recent large tropical volcanic eruptions”. It’s enough to make a man wish that there was the equivalent in science of the “Truth In Advertising” laws. These guys actually think that they can make large-scale generalizations from two, count’em two, measly examples. In any case, I thought I’d take a look at the winters (December-January-February, DJF) following the two large volcano years. Here’s that result.